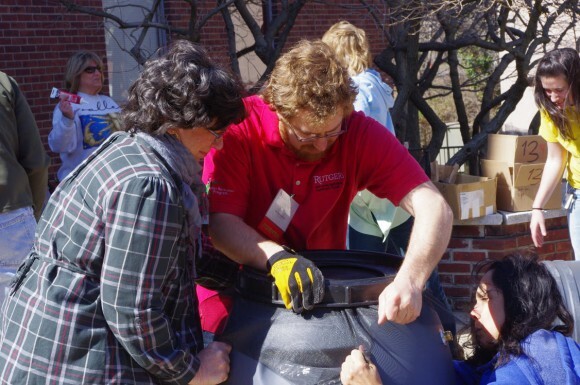 Share the post "Rutgers Home Gardeners School: Green Thumbs Invited to Let Knowledge Bloom"
Rain Barrel Workshop at Rutgers Home Gardeners School. Photo credit: Rebecca Sheil Rathmill. Gardening enthusiasts are invited to register for the upcoming Rutgers Home Gardeners School to be held from 9 a.m. to 4 p.m. on Sat., March 19 on the Cook/Douglass campus. This year marks the 40th offering of this annual event, which many attendees come back for year after year. Designed to offer “something for everyone” seeking a greener thumb, the Rutgers Home Gardeners School is made up of 35 individual workshop sessions covering a wide array of horticulture topics. This format allows attendees to select the workshops that are most relevant to their gardening interests in order to create their own unique, customized schedule for this fun day of learning. Dynamic speakers from commercial horticulture and landscape design firms, as well as faculty and staff from Rutgers Cooperative Extension (RCE), provide attendees with valuable opportunities to learn from seasoned professionals with a wealth of knowledge and experience. Workshop topics for the 40th Annual Home Gardeners School include perennial favorites, such as canning fruits and vegetables, easy drip irrigation, composting, and pruning, as well as 21 brand new offerings to keep the content fresh and timely for returning attendees. Subjects for the new workshops include basic soil science, great garden day trips, plant propagation, and flowering shrubs, to name just a few. 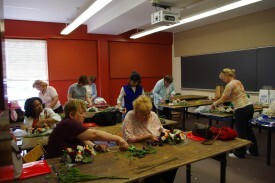 Hands-on floral arranging session at Rutgers Home Gardeners School. Photo credit: Rebecca Sheil Rathmill. For those looking to grow their skills through interactive experiences, this year’s Home Gardeners Schools offers a demonstration workshop (featuring a small paver project) and two hands-on workshops (covering repotting/maintaining orchids and fresh flower arranging). 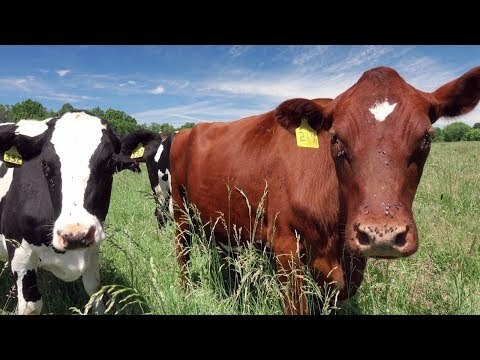 A special lunchtime keynote discussion will focus on the work being done at Rutgers to rediscover flavor in strawberries and tomatoes, presented by RCE agricultural agents William Hlubik (Middlesex County) and Peter Nitzsche (Morris County). The registration fee for this event is $75, but a special early registration discount price of $60 is being offered through March 5. An additional discount is also available for Master Gardeners. Participants can purchase a $10 box lunch when registering or bring their own bag lunch. Pre-registration is recommended. For more information or to register, visit www.cpe.rutgers.edu/hgs or call the Rutgers Office of Continuing Professional Education at 848-932-9271.